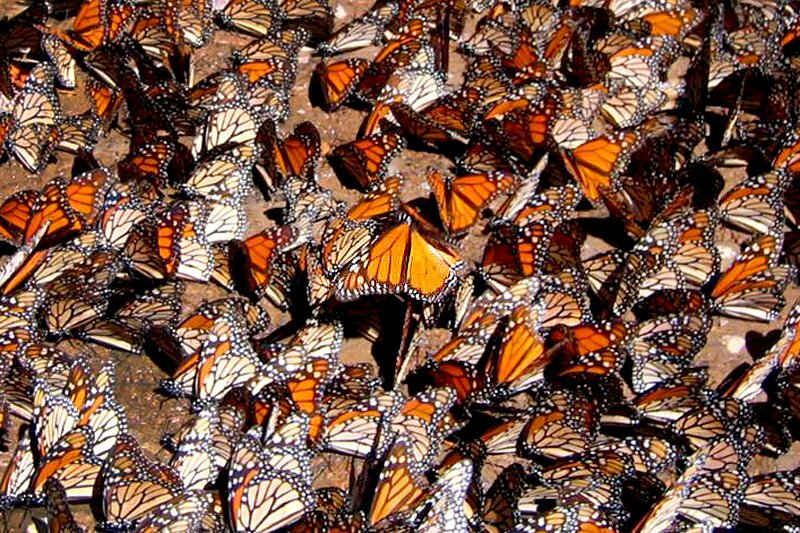 One such journey takes you to the State of Michoácan’s Santuario de Mariposa el Rosario, in Angangueo, the famed winter breeding ground of the monarch butterflies. The best way to access it, as I did, is to fly into Mexico City and rent a car for the two-hour journey. Get on Mex-15-D west to exit Mexico City towards Toluca, then resume Mex 15 and continue west through the subtropical Toluca Valley towards the arid highlands. The trip takes you through dusty mountain roads, past strange ruins and mysterious mountain monastaries, and eventually into the fragrant transvolcanic pine forests. Michoácan’s volcanic fir forests are hidden well in the central highlands, so you’ll also want to pay close attention to road signs and directions. Be sure to arrive at the butterfly sanctuary by noon, when the butterfly activity peaks. The trail to the mountaintop groves is a rugged, high-altitude trek exceeding 10,000+ feet, so take it easy and drink lots of water, even if you’re driving most of it. You can hire a guide (Great Tours’ Luis Jiménez is a good one: rodland26@hotmail.com or + 443-353-2442) or pay local children to show you the secret trails. As I chugged up the rocky dirt road, one particularly daring local boy jumped onto the side of my moving car as it careened around a precipitous corner and insisted that he become my guide for 50 pesos ($5). I couldn’t resist his entrepreneurial spirit. The reward was that he showed me local trails that the tourists don’t take — worth every peso. Besides, you have more to see. Soldier on for another two hours down the corkscrew toll-roads to Pátzcuaro (15D to 43D), passing the Pureapuecha ruins of Tzintzuntzan (The Place of Hummingbirds) on a windswept plateau overlooking Pátzcuaro Lake’s villages, which are known for their crafts, like beautiful guitars, lacquerware, and copper. Dream about the experience at the elegant and old fashioned Mansion Iturbe (a member of the presitgious Epoque Hotels collection, with rooms from $85/night), It's been run by the same family since 1790. They're good for a few more detours.